I am a full time artist creating colorful, abstract 2D artworks in a wide variety of media. I also create outdoor constructions by repurposing common objects such as umbrellas, trays, and lawn ornaments. Thursday, March 1st at the Westminster MD library in the evening. Friday, March 2nd at the Finksburg MD library in afternoon. Saturday, March 3rd at North Carroll Library in Hampstead MD in the afternoon. Creating abstract acrylic paintings by pouring paint onto a flat surface in various ways is one of the most enjoyable art creation techniques. It is a bit messy, but once you are set up, it is an incredibly fast way to create quite beautiful abstract images. As art techniques go, acrylic pouring is fairly new and and easy to learn. Also, pouring techniques are somewhat age and skill independent – they can be done by just about anyone, from novices to experienced professional artists. The workshop will consist of a discussion of materials and demonstrations of a couple basic techniques, followed by the chance for each participant to create a couple of small paintings to take with them. Pouring paint can be a bit messy, so old clothes are recommended. I just finished installing my latest 3D geometric construction in my sculpture garden. 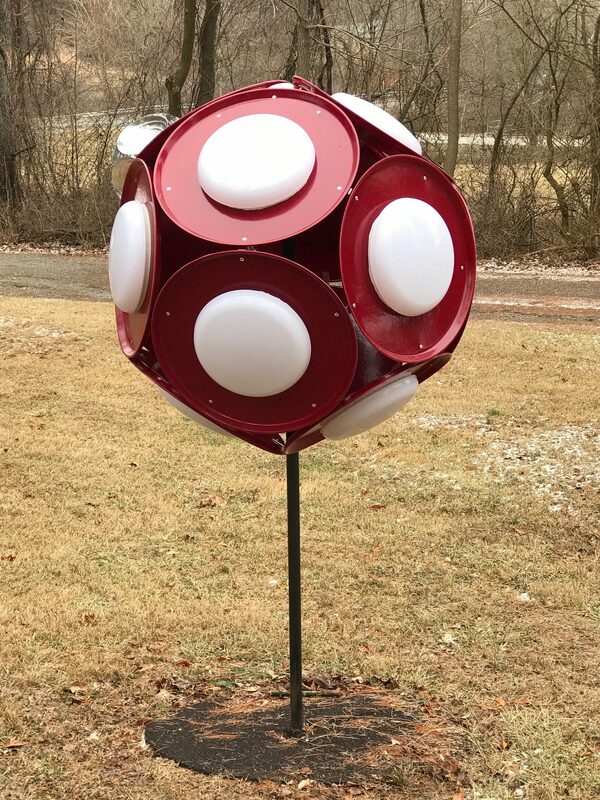 This one is made from 12 fiberglass serving trays in a dodecahedron configuration. Initially the trays were plain, but I found the design a bit lacking in interest so in the center of each tray I glued a light fixture shade to add interest.